Jacob Yates - The Hare. The Moon. The Drone. Vinyl LP. Bleep. 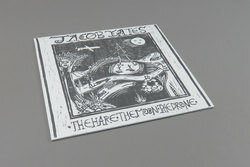 Optimo release the first solo album from legendary Scottish surf rock hero Jacob Lovatt aka Uncle John aka Jacob Yates. Following the cult success of Uncle John & Whitelock, Lovatt started Jacob Yates & The Pearly Gate Lockpickers, a frequent name on the Glasgow gig circuit. For this album he strips everything back and relies on his talent for lyrical storytelling to take us on a journey through a myriad of freaky tales. Absolutely essential for all Scottish dreamers, skaters and late night bar crawlers. Optimo go back to their label roots with DIY tinged local indie rock gear!